Yesterday was my first day ever on the job after 1 month & 4 days of training!Wooohooo.It was super duper hectic that it was the FIRST time in the 1 month & 4 days of training that me & my friends didn't get to enjoy our lunch break and instead,took a quick bite & continued working!woaahh.. There were some uber difficult cases that I had to handle and it happened during my first day! !uwaaaa..Thank god for my friends,the seniors and team leaders for helping me!Some of them involved people with accents whom I just didn't understand what they were saying and thankfully I managed to overcome that by listening intently and asking questions.Phew!Some cases involved 2 people at once and some involving people from outside of Malaysia.Some were complicated and man am I glad that time travel so fast! 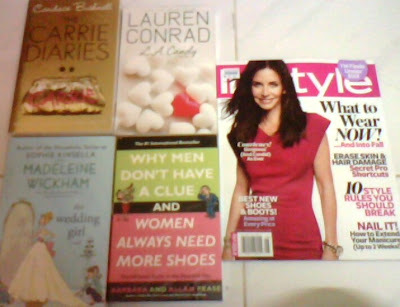 Got lots of things to blog about but because I have other things to do that I have put off since the internet can be addictive,I will leave you with a picture of some reading materials that I bought yesterday,on a whim.I just couldn't resist all the books and of course InStyle mag is a monthly purchase..:)..Bought The Carrie Diaries by Candance Bushnell,LA Candy by Lauren Conrad,The Wedding Girl by Madeleine Wickham and Why Men Don't Have A Clue and Women Always Need More Shoes..hehe..The last book was recommended to me by an old friend & I was intrigued by it..Just read a few pages & it's quite okay..